What a fun week at school. Look what we did as we learned together. 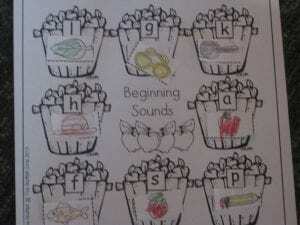 The kinders are doing a fantastic job of stretching out the sounds in our popcorn words. 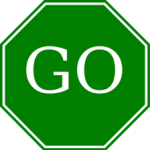 They also noticed that GO and NO rhyme. How cool is that! 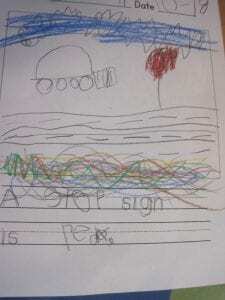 They found them in our emergent books, daily messages too. 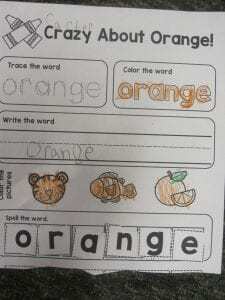 COLOR WORD: ORANGE We read many pumpkin books to celebrate the color orange. 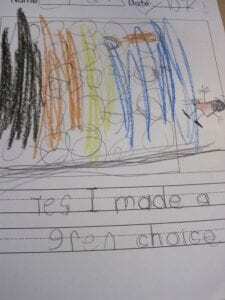 It was a perfect week to do this as many of the kinders have visited pumpkin patches. 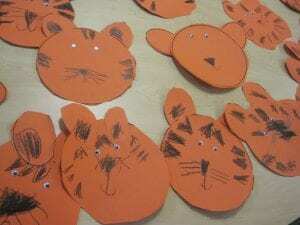 The kinders had fun making an adorable orange tiger for the weekly color craft. The kinders guessed my orange surprise snack—-oranges! A tasty and healthy mini snack. SCIENCE: Scientists observe and look closely at objects. Scientists also label things. We were scientists in the classroom this week. 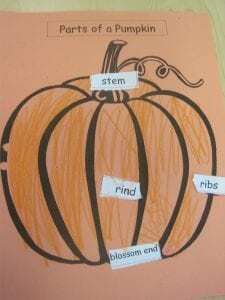 We read a non-fiction book to gather information about how pumpkins grow. 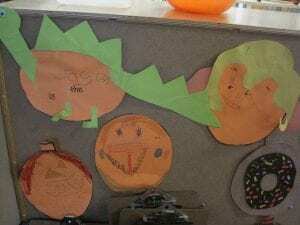 Making our own “flow map” to show the life cycle of a pumpkin and singing a song to help us remember was fun. 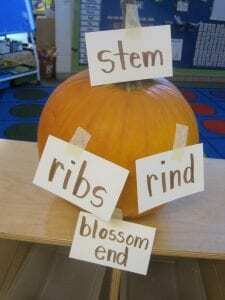 We investigated a real pumpkin by learning the names of the parts of the pumpkin…stem, ribs, rind, blossom end. 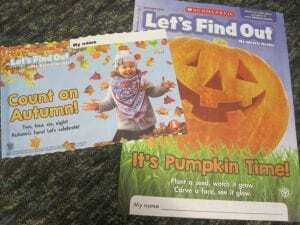 We also read 2 newspapers….one that reinforced our learning about pumpkins and one about Autumn. Scientists also do experiments. 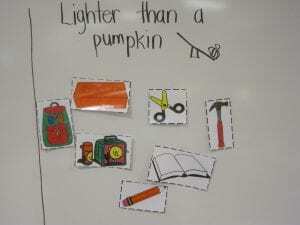 We did an experiment to see what objects were heavier or lighter than our pumpkin. Oh, my! What a fun way to learn! 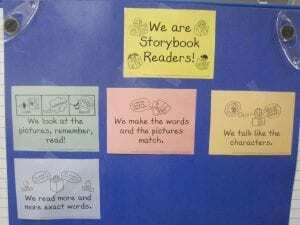 READER’S WORKSHOP: The kinders found out that “We are Storybook Readers”when we read favorite books such as Froggy books, Pete the Cat and Elephant and Piggy. 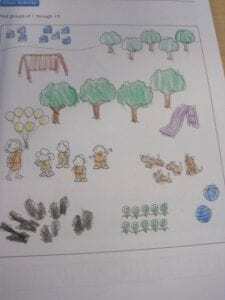 They learned that readers look at pictures, remember them and then read. 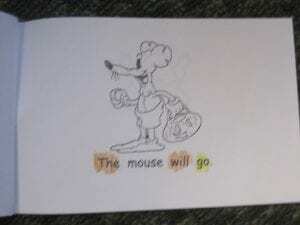 Readers also make sure the words and the pictures match. When a reader changes their voice for different characters, it makes the story so much more fun. 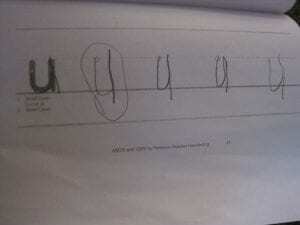 HANDWRITING: We continued to learned how to properly write more “counter clockwise” lower case letters of e,s,o, u. 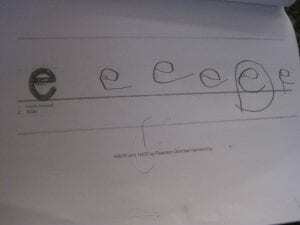 A few of these letters are tricky so keep practicing at home. It is helping! 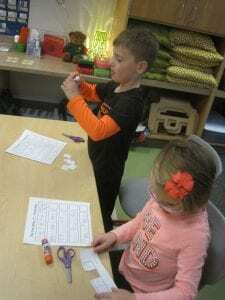 WRITING WORKSHOP: The kinders are doing a fabulous job drawing detailed pictures, labeling their pictures and stretching out sounds in words as we write a matching sentence while using as many popcorn words as we can. After that is all done, the kinders share their writings with their partners. 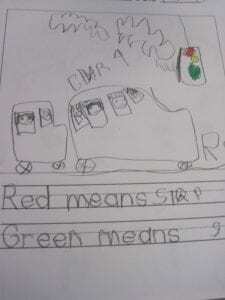 This week’s topics were about stop signs, traffic lights, walking quietly in line and making green choices. We have amazing writers! 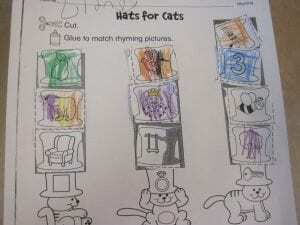 LITERACY: I am beginning to re-assess the kinders on their literacy skills….letter sounds, rhyming, hearing sounds in words, etc. in preparation for parent teacher conferences. 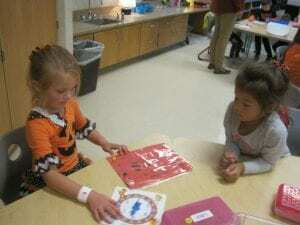 The kinders played games to strengthen their skills in letter ID, letter sounds, hearing syllables in words. 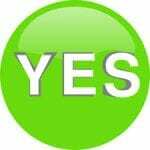 I am excited about their progress and will share their progress with you. 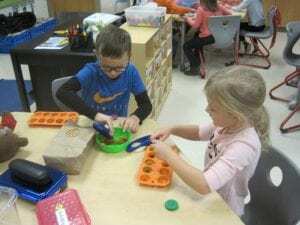 Thank you for working and supporting your kinder at home. 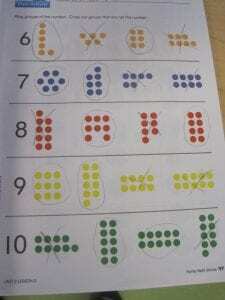 MATH: We wrapped up our first unit in Math by taking our first Math test this week. 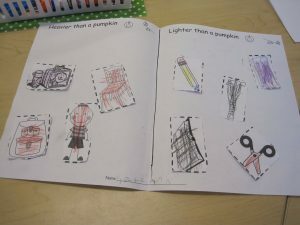 The kinders felt really important when they got to use their own “office” (a folder separating them from their neighbor) while taking their test. 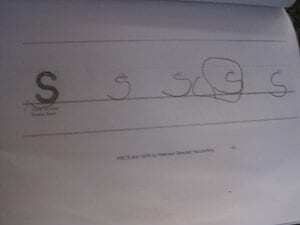 I will share these tests with you at conferences. I am amazed at how much each kinder has grown in their math skills and abilities!! Thank you for working and supporting them at home. We started unit #2 by searching for groups of objects 1-10. 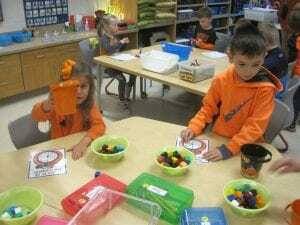 Friday math games consisted of HOW MANY PUMPKINS? 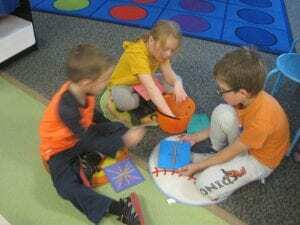 (counting groups of objects 1-10 using fine motor skills), HOORAY FOR APPLES (ID numbers), RACE TO FILL THE PUMPKINS (or buckets)(counting objects),ITSY BITSY SPIDER PATTERNS (extending patterns) and exploring and creating designs with GEOBOARDS. The kinders really look forward to Friday math games that reinforce concepts learned during the week. 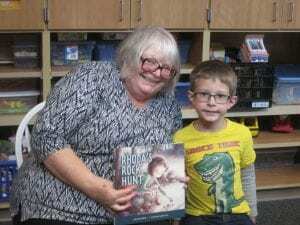 MYSTERY READERS: On Wednesday, Carter flew into his grandma’s arms when she walked into our room. 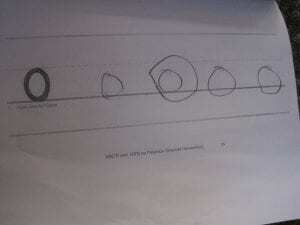 She read Rhoda’s Rock Hunt because Carter LOVES to go rock hunting. She even surprised the kinders by giving each of them a special smooth rock so they could begin a collecting rocks. Thank you for the sweet gift. On Friday, Addison was very excited to see her mom be the Mystery Reader. We heard Adddison’s favorite book Room on the Broom, a fun rhyming story for this fall season. 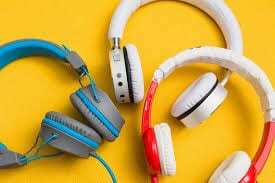 *Headphones Needed: Our STEAM teacher, Mrs. Totten is asking that your kinder bring in headphones (the type you can plug into a computer) to keep at school to use during STEAM class throughout the year. These headphones do not need to be fancy. Often they can be found at Five Below, where you can purchase them for under $5.00. If you could please send in a pair of headphones marked with your kinder’s name by Nov. 1 it would be greatly appreciated. If you cannot send in headphones we do have extra for them to use. 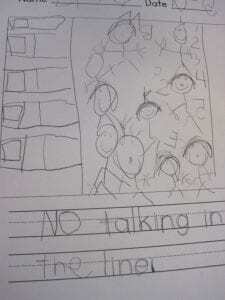 *KOOL KINDERS: The kinders are excited to be the Kool Kinder again. We are now drawing out a stick with a kinder’s name on it to determine the next day’s Kool Kinder. A yellow reminder note will come home the day prior. The kinders are bringing in a show and tell item from home. After you choose the show and tell item, please talk with your kinder about what information they are going to share with the class. We love to hear why they chose it, who gave it to them or where did they get it, etc. This week Adelyne brought in her Cabbage Patch cat, Breslyn brought in a horse, Alesha brought in an unicorn and Tinley brought in her flippsy doll, Zoe. *WARM SWEATSHIRTS OR COATS: Please continue to send your kinder to school wearing a warm sweatshirt or coat for outside play. The mornings and days are becoming cooler, but we still go outside to play. 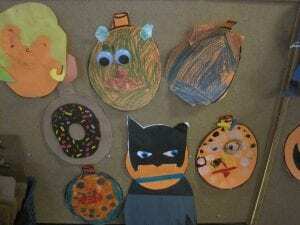 *FAMILY PUMPKIN PROJECT: We have quite a few pumpkins that are disguised as cats, gumball machine, Snoopy, jack-o-lantern, superheroes, dinosuar, gummy bear and a donut. Pumpkins can come to school anytime next week. We will add them to our display. *Thursday, Oct 30—School Picture Retake Day Please return the original picture package during retakes. 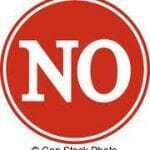 Absent students pictures will be taken at this time. *Wednesday, Oct 31—FALL PARTY AND PARADE— The kindergarten parade will begin at 10:15am. Our classroom party will follow 10:30-11:30am. Fun activities are being planned. Your kinder is welcome to wear the basics of their costume to school and/or the under layers. We will then add the accessories and the outer layer of costumes before the parade. Otherwise they can bring their costume to school in a labeled bag. They will be putting on their costumes OVER their school clothes prior to the parade. WE WILL NOT TAKE TIME TO REMOVE CLOTHES AND PUT ON OTHER CLOTHES. 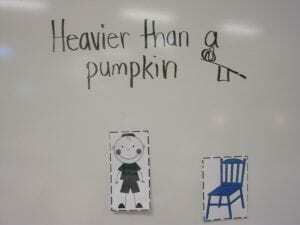 If your kinder’s costume is regular clothes (farmer, cheerleader,etc ) they are welcome to wear them all day if it will not hinder their movement and learning. WEAPONS OF ANY KIND OR SCARY, GORY MAKEUP ARE NOT ALLOWED. Please be respectful of others. Non-food donation items can be sent into school anytime! *November 5 & 7–Parent Teacher Conferences: I am looking forward to sharing the awesome progress your kinder has and is making. *November 5-8—Book Fair: We are scheduled to purchase books on Wednesday, Nov 7 from 2:00-2:30pm. Please send your kinder’s money in an envelope labeled with YOUR KINDER’S NAME and BOOK FAIR if you wish them to purchase books. The book fair will also be open during conference times. 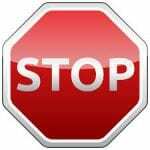 This is optional. The proceeds go towards purchasing books for use in school. Thank you! 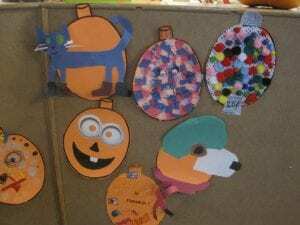 This entry was posted in Newsletters and tagged color words, fall party, headphones, mystery readers, P/T conferences on October 19, 2018 by kathybohl.